A beautiful small town just a few hours from Toronto, Niagara-on-the-Lake is a place where families enjoy quiet picnics and shopping in the heart of Ontario’s wine country. With the return of the spring weather, also come the migrant farm workers, most from Jamaica, to work the fields for long hours each day. Each May, however, for the past few years, the migrant workers put down their tools and gather at Orchard Park Bible Church for the Workers’ Welcome Concert with the Toronto Mass Choir. 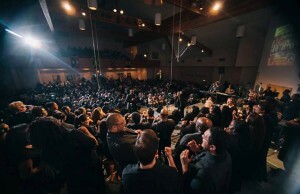 Since 2010, the Toronto Mass Choir has been performing with NewWorldSon at welcome services spearheaded by the hard work of Jane and Brian Andres. When the choir met this power couple while recording with NewWorldSon in 2009, they jumped at the chance to become involved in something very close to the hearts of many choir members whose own roots are from the Caribbean. Although many choir members have roots in Jamaica, even they were unaware of what happens with their friends and family once they leave their families and arrive here in Canada for many months of hard work. The Workers’ Welcome concert is an event that welcomes over 400 migrant workers from the Niagara region to show the region’s appreciation and to bring them a piece of ‘home away from home’. On May 5th, 2013, the workers arrived by the bus load in anticipation of this ‘standing-room only’ event that they have begun to look forward to each year. Jane and Brian Andres began the evening with local drummers and a warm welcome by town Mayor Dave Eke. Under the direction of Karen Burke, the TMC then led the audience into an hour of more lively gospel music, God-honouring sweat and Caribbean praise! With Caribbean tunes such as Heaven Medley, Stand Up, Mawnin’ Train, and Excellent from their full Caribbean ‘Going Home’ gospel album, and worship songs such as O For A Thousand Tongues, the energy in Orchard Park Bible Church brought everyone to their feet. To close, and as an encouragement to these men who face uncertain times, a music team of migrant workers led the event’s anthem “Hold To God’s Unchanging Hand” supported by the choir. The choir counts it a privilege to support the work of the Andres and join with the migrant farm workers in a great evening of praise! For TMC members looking out into a full crowd of excited worshippers, it certainly was a heavenly view.